The charioteer Koiranos suffers a twofold misfortune. He dies in place of the king Idomeneus. Then there is no battle to rescue his body from the enemies. 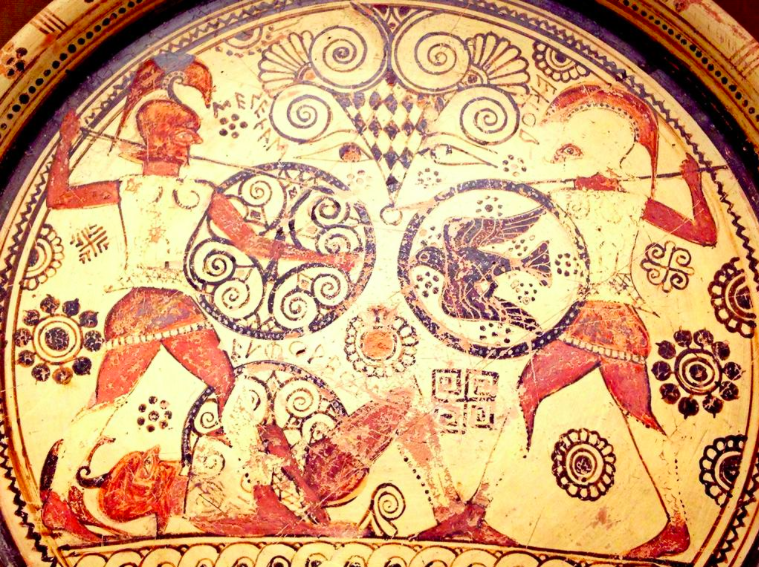 Here Hector and Menelaos fight over the corpse of Euphorbos. Circa 600 BCE. §0.1. In the posting for 2015.05.08, where I studied the athleticism of heroic chariot fighting, I highlighted the example of Mērionēs in Iliad 17, who fights on foot in a situation where we might have expected him to be doing something else, which is, to be driving the chariot of Idomeneus, king of all the Cretans who fought at Troy. In the posting for 2015.05.20, I will study another Homeric example where a hero could have performed as a chariot driver but chose instead the role of a chariot fighter. §0.2. Before I can get to that example, however, I need to consider a counterexample, that is, a situation where the chariot driver never gets a chance to become an understudy for the chariot fighter. §1. In the case of Mērionēs in Iliad 17, his role as a chariot driver has been taken over by a hero named Koiranos, who is driving the chariot in which the king Idomeneus is riding. This Koiranos gets killed when he is hit by a flying spear that Hector was aiming at Idomeneus (17.610–612). So Koiranos “takes the hit,” as it were, for the king, and it is no accident, I argue, that the name of this hero Koiranos is derived from the noun koiranos, which actually means ‘king’ in the Iliad (as at 2.204, etc.). §2. At the moment of his death in the Iliad, Koiranos is described as the opāōn ‘follower’ as well as the hēniokhos ‘charioteer’ of Mērionēs (17.610). As we see from the research of Ellen Aitken (1982) on the first of these two Homeric words, the opāōn or ‘follower’ of a hero is meant to be the ‘successor’ of that hero. So, an opāōn is not expected to die. A shining example is Mērionēs himself as the opāōn ‘follower’ of Idomeneus in the Iliad (7.165–166, 8.263–264, 10.58–59, 17.258–259). He does not die in the Iliad. By contrast, the hēniokhos ‘charioteer’ of a hero is expendable in Homeric narrative, frequently “taking the hit” for the hero who rides with him, as we can see in the case of the three heroes who drive the chariot of Hector in the Iliad: the first of these charioteers to “take the hit” for Hector is Eniopeus (8.118–123), the second is Arkheptolemos (8.312–315), and the third is Kebriones (16.734–754). 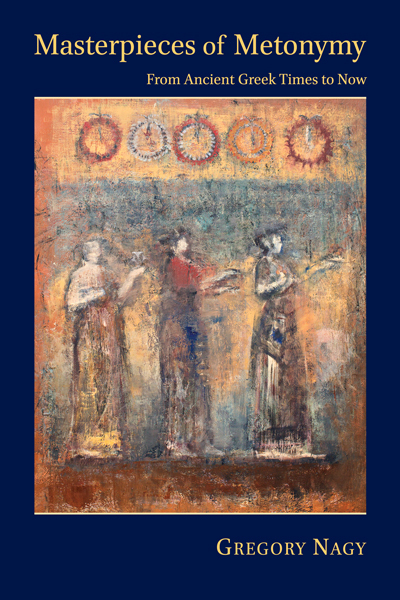 In the case of the first two of these charioteers, Hector feels intense grief at their deaths, but he immediately finds a replacement, whom he orders to mount the platform of the chariot and take the reins (8.124–126, 8.316–317). In the meantime, as we see in the case of Arkheptolemos, Hector leaps off the platform to fight on foot (8.318–321). According to the logic of the Homeric narrative, Hector will need to have a new charioteer ready to pick him up when the time comes for him to leap back into his chariot after he finishes his apobatic fighting on foot. §3. So also with Koiranos, charioteer of Mērionēs. He too, like the three charioteers of Hector in the Iliad, is expendable. But that is because he is driving the chariot of Idomeneus. If he had been driving a chariot for Mērionēs instead of Idomeneus, we would not have expected him to “take the hit” for the chariot rider, since his status as opāōn of Mērionēs made him elegible to become that hero’s successor. The misfortune of Koiranos is that he is now the driver not for Mērionēs but for Idomeneus. And Koiranos is clearly not an opāōn for Idomeneus. Rather, he is merely the charioteer of the moment. That is how it can happen that Koiranos “takes the hit” for Idomeneus, though we would not have expected him ever to “take the hit” for Mērionēs, just as Mērionēs will in fact never “take the hit” for Idomeneus. §4. Although all three of the charioteers who drive the chariot of Hector in the Iliad are doomed to be killed, at least the third of the three drivers, Kebriones, does not suffer the indignity of having no one to fight for his body in order to rescue it from getting despoiled by the enemy. Unlike the heroes Eniopeus and Arkheptolemos, whose bodies are left behind by Hector in his eagerness to find a new charioteer ready to pick him up when the time comes for him to leap back into his chariot after he finishes his apobatic fighting on foot, the hero Kebriones gets the honor of being treated differently in death. In this case, Hector will at least fight for the body of his charioteer of the moment. After all, Kebriones is the half brother of Hector (8.318, 16.738). §5. In the posting for 2015.05.08, I already noted the relevant battle scene in Iliad 16 where Kebriones gets killed. We start with the moment when Patroklos, who is about to engage in mortal combat with Hector, leaps out of his chariot, hitting the ground running (16.733), and immediately picks up a rock and throws it at Kebriones, the charioteer of Hector, hitting Kebriones on the forehead and smashing his skull (16.734–754). Things are happening so fast that we do not get to see Hector’s reaction, because that hero is at this same moment leaping out of the chariot driven by Kebriones, hitting the ground running (16.755). §6. As I also noted in the posting for 2015.05.08, Patroklos and Hector proceed to fight one-on-one in mortal combat on foot—a combat that is ultimately won here by Hector (16.756–863). What I did not note in that posting, however, is a detail about this mortal combat as it gets underway: Patroklos stands over the corpse of Kebriones, evidently intending to despoil the body by stripping the armor of that hero (16.751). §7. So, the collision course of the two apobatic warriors Patroklos and Hector, who both leap off their chariots and start running toward each other, modulates into a “freeze-frame” picturing the static image of Patroklos standing over the corpse of Kebriones. Signaling this “freeze-frame” is a simile comparing the two warriors to two hungry lions who lunge at each other as they fight over the carcass of a deer (756–758). So also, the narrative says, Patroklos and Hector hiento ‘lunged’ at each other (759–761). By way of the word that I translate as ‘lunged’ here (ἵεντ’ at 761), the momentum of the collision course is regained, but the focal point remains the “freeze-frame” picturing the static corpse of Kebriones: Hector is holding it by the head, while Patroklos is holding on to it by the foot, and neither one of them is letting go as they pull in opposite directions. §8. I need to contrast here the example of Kebriones with the examples of Eniopeus and Arkheptolemos, who were the previous two charioteers of Hector. In both these examples, Hector feels grief when his charioteer takes the hit for him—but he immediately proceeds to get another charioteer who will leap into the chariot. In the third example, by contrast, Hector fights for the body of Kebriones instead of immediately trying to find a replacement. §9. As we compare these three examples featuring the three charioteers who “take the hit” for Hector with the example featuring Koiranos as the charioteer who “takes the hit” for Idomeneus, we might have expected Idomeneus to feel grief for Koiranos—but then to get another charioteer. Or we might have expected him to leap off the chariot and to fight for the body of Koiranos. Neither event happens. Instead, Mērionēs intervenes. This hero, who is already fighting on foot, picks up the reins that Koiranos has just dropped to the ground and hands them over to the king Idomeneus, who is still standing on the platform of his chariot. The king, as Mērionēs tells him, must now become his own charioteer in place of Koiranos while he, Mērionēs, stays behind to fight. §10. By now we can see that the misfortune of Koiranos as charioteer is twofold. Not only does he get killed in place of the king Idomeneus. It is worse than that. Once he gets killed, he has no one to fight for his body—to rescue it from getting despoiled by the enemy. Meanwhile, the rider of the chariot that Koiranos was driving, Idomeneus, is making a getaway. Although he is the king of all the Cretans who fight at Troy, Idomeneus now takes on a new role as the driver of his own royal chariot as he speeds back to safety. Aitken, E. B. 1982. 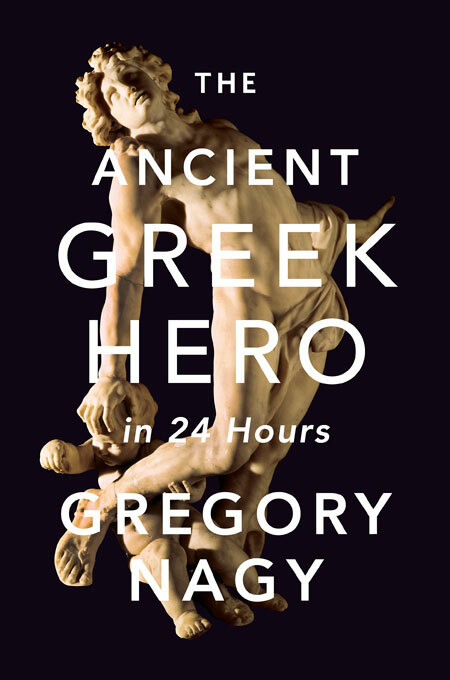 “ὀπάων [opāōn] and ὀπάζω [opazō]: A Study in the Epic Treatment of Heroic Relationships.” A.B. Honors thesis, Harvard University.